When I heard the news that a root CA named DigiNotar had issued a fraudulent Google SSL certificate, the first thing I wanted to do was make sure my computer was safe. This is a quick post to help you do the same. Since I use a Mac, my first stop was Keychain Access. 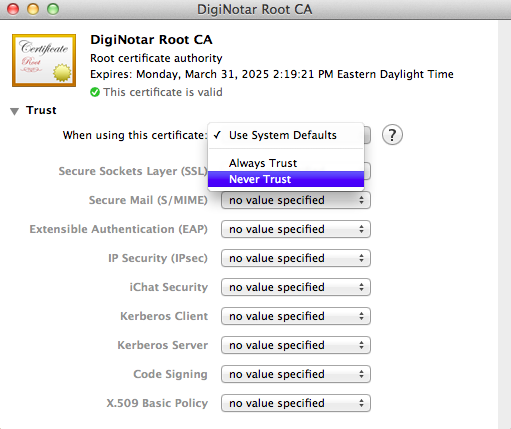 I quickly found the DigiNotar root certificate. Next, I removed all trust. This takes care of Safari and Chrome. I went through a similar process for Firefox, and have since discovered a detailed post from Mozilla showing you how to do exactly what I did. There are also instructions for verifying that DigiNotar really did issue a fake Google SSL certificate.